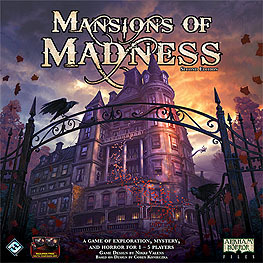 Mansions of Madness is a fully cooperative board game of horror and discovery for one to five players. Players take the part of investigators, entering the darkened rooms of haunted Arkham mansions and other sinister locales to discover strange secrets, solve cunning puzzles, and battle otherworldly dangers. Mansions of Madness also includes a bonus conversion kit that allows fans of the first edition to use their investigators, monsters, and map tiles in this new edition. A free digital app is require to play your copy of Mansions of Madness.